Add an enhancing and adorable 3D decorative object to your nursery room and say good bye to being alone in the dark - This Handmade unique children's night lamp will add happiness and magical atmosphere to your children's, Baby or adult Bedroom and will spark their imagination on day time and just before they get to slip. 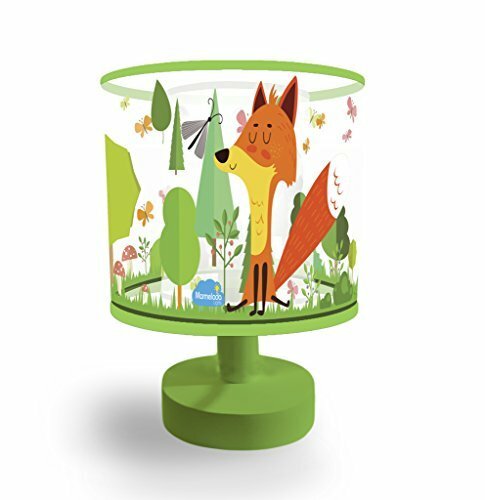 The cute 3D Forest Fox Scene in this enchanting decorative Bedside night lamp will help your little one drift into a calm and relaxing sleep. Very reliable, easy and simple for use without all useless nor nonessential features - Just all you need to create a pleasant healthy and relaxing bedtime experience Micro 3V LED energy-efficient and eye-caring. Operated by 2 AA batteries (Not included). 30 minutes Electronic Auto shut off timer. The Micro SMD LED inside do not emit heat and is perfectly safe for use in your nursery and kids Bed room. Comes in an exclusive open window Gift Box. A fabulous gift idea especially for Babies, kids, girls and ladies. Since it's all handmade, actual product may vary slightly from its reference photos. This item is not a toy, keep away from children. APPEARANCE: Mini Size, Cute 3D Printings of Forest Fox scene on 2 layers of Transparent PVC in high quality Wooden Base, Beautiful and lovely Bedside Night Lamp. Not only can be used as night light but also be used as a Nursery decorative item on day time. Comes in an exclusive open window gift box. SAFETY: This unique Micro 3V LED energy-efficient and eye-caring LED Night Light creates a uniform non-flickering light that doesn't hurt the eyes and does not emit any heat so is perfectly safe for use in your nursery, baby, or kid's bedroom. PORTABLE: Tabletop, Bedside or bookshelf, fully portable Kids Night Light. No need for Cables, Electric outlet or charging. Great for new moms to use when breastfeeding on night time. EASY TO USE: This beautiful handmade Kids room Lighting is operated by only 2 AA batteries with a 30 minutes electronic shut off timer. Only 1 simple On/Off switch without any complications nor unnecessary features for a just a calm and healthy night sleep. More than 2 months runtime in normal use. If you have any questions about this product by Marmelada Lights, contact us by completing and submitting the form below. If you are looking for a specif part number, please include it with your message.